Cars can be a dog’s best friend, and their worst enemy. Just ask Romy. This sweet girl almost lost her life to one, but today she’s back and hoppy as ever thanks to the love and support of people who love her. 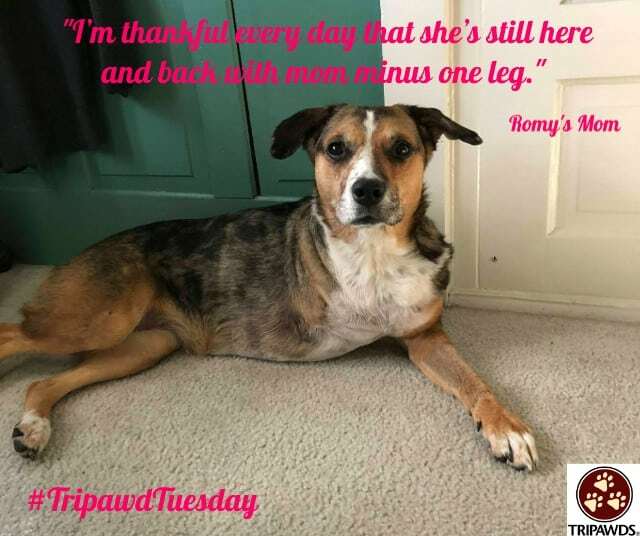 We know you will too after you read Romy’s Tripawd Tuesday spotlight of bouncing back from a car accident and rough amputation recovery. I got Romy when she was 10 weeks old six years ago. We fell in love with her instantly, however this was my first dog and I had some trouble getting used to taking care of a puppy, especially a herding breed like Romy. Border collie/Aussie/boxer is what we were told. And man, a stubborn woman raising an incredibly smart and stubborn dog led to some serious talks about whether we (my mom and I, i lived at home at the time) should keep her. But in the end I’m glad I did and with the extra training she’s received she’s shaped up to be the most perfect dog I know. I can take her anywhere and never worry about her interactions with people or other dogs in public. (As a herder though, she does tend to nip at a heel every once in a while. At six years old I think this is just a Romy-ism. I rushed her to the vet with the help of some awesome strangers and they told me nothing was broken, no internal injuries and no fractures. It was a huge relief, however her elbow had completely luxated (this meant her elbow joint had completely detached leaving her leg completely useless and painful). They doped her up and had us head over to the emergency animal hospital. After an agonizing hour wait we were told they could try to pop the joint back into place without surgery and would have to be in a cast for about two weeks. Great, I thought! She’s going to make it unscathed! The first week was brutal, as pain meds aren’t Romys favorite thing to experience. It was basically a week of strict confinement and her being a nervous wreck from the medication. But I knew she was tough and would take it like a champ. Which she did! After a week in a cast it was time for a bandage and cast change so we took her in and were told to wait. Then I got the call. Upon removing the cast they realized her elbow had completely dislocated again only this time, they didn’t know for how long since the cast kept her leg straight and the pain meds covered up any discomfort she may have had. That combined with not moving for a week, it went completely unnoticed. I spoke with the doctor and she gave me two options. Surgery or amputation. At first amputation wasn’t even an option. I couldn’t do that to her. But then the doctor talked to me some more. She explained the procedure for surgery first. It was highly invasive and would render Romy completely immobilized for about 4-5 months. 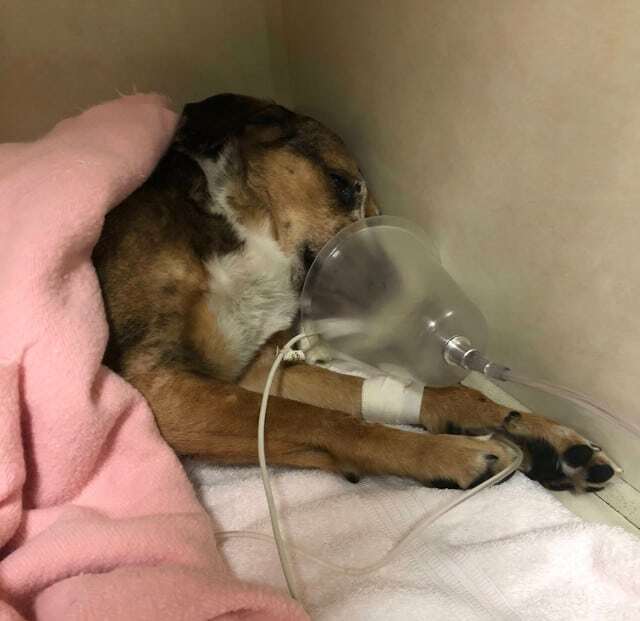 Even if surgery worked, she would have developed serious arthritis from the trauma and would have to be on pain medication the entire time. This would have led to a life of more pain and suffering for her and seeing her ready to get back in the groove of things, I had to stop being selfish. I had already maxed out 4 credit cards to pay for everything and surgery would have led to an insane amount of debt and that doesn’t factor in the cost of rechecks, med refills, bandage cleaning and changes, all that. I had to be calm and think of what was best for my pup. The doctor was incredibly sweet and said she had two border collies at home. If it were her in the situation she said she would choose amputation in a heartbeat. See, these dogs are strong runners. Surgery would have taken that joy completely out of the picture for Romy. I couldn’t fathom doing that to her. So we chose amputation. Two weeks in stitches (and let me tell you that healing process wasn’t easy for us!) and my girl was back to normal. Running, jumping, playing like she’s always had three legs. I couldn’t be more proud of her! 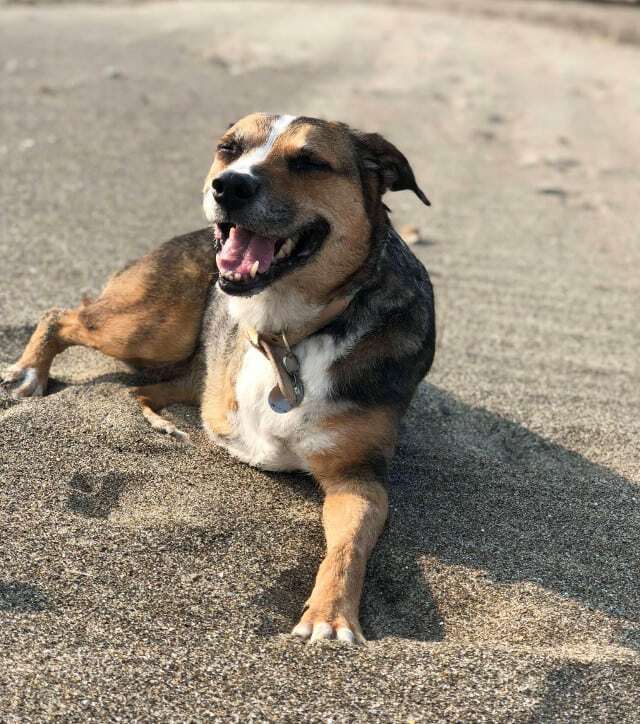 We just took our first beach trip since the accident and she was able to run as fast as she did with four legs. Not to mention the extra attention three legged dogs get! My goodness!! I had an incredibly strong support system as well and everyone around me knew I made the right decision for her. My family, friends, and everyone I work with we’re heartbroken that I had to make that decision. Everyone in my life knows how important Romy is to me and how much I love and adore her! Having that support is what got me through this in one piece! 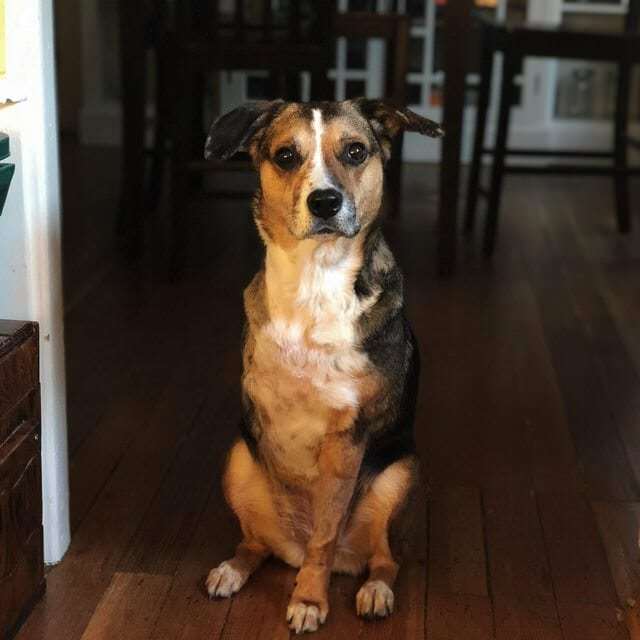 So now we continue life (3 months after surgery) as a Tripawd and a Tripawd owner. I’m still learning that’s for sure, but they way Romy has recovered and the growth our bond has endured is something incredibly special. I’m thankful every day that she’s still here and back with mom minus one leg. Thanks for reading this wall of text! It was definitely a five minute time span that changed my entire life!